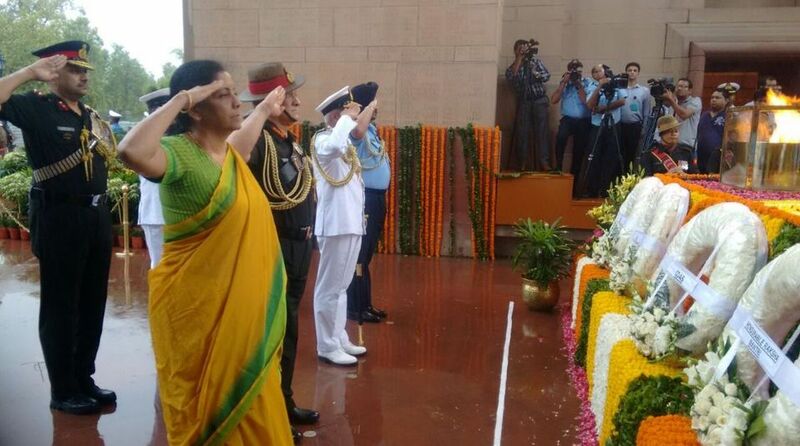 Paying homage to the Kargil martyrs on Thursday, Defence Minister Nirmala Sitharaman expressed confidence that the Indian armed forces would continue to serve the country with unwavering dedication and discipline in keeping with their glorious traditions. The minister along with the three Service Chiefs on the occasion of Kargil Diwas-2018 paid homage to the courage, valour, and sacrifices of the heroes of Operation Vijay at Amar Jawan Jyoti here. Sitharaman extended greetings and best wishes to all the ranks of Indian armed forces, Veterans and their families on the occasion. Smt @nsitharaman & the three Service Chiefs laid wreaths and paid homage to the martyrs on #KargilVijayDiwas at Amar Jawan Jyoti in New Delhi. We salute all the bravehearts who proudly protect the nation. The Indo-Pak Kargil conflict, known as Operation Vijay, was fought between May and July 1999, in the most inhospitable and rugged terrain along the Line of Control (LoC) from ZojiLa in the West to Turtok in the East. The conflict was engineered by Pakistan, infiltrating its troops and occupying vacated dominating heights across the LoC overlooking and threatening the national highway besides violating territorial integrity of the nation. Indian Army soldiers, displaying utmost fortitude and resilience, fought legendary battles in Dras, Kaksar, Batalik and Turtok sectors at heights above 12,000 feet and evicted Pakistani intruders. The Indian Air Force also contributed significantly and supported the Army operations.